One of the attractions I read about in a Thailand travel book is a homestead set up by an American in Bangkok in 1959. Jim Thompson, originally from Greenville, Delaware, so appreciated the style of the teak, traditional Thai homes, that he bought several, dismantled them and brought them to their current site. They are now open to the public for tours. 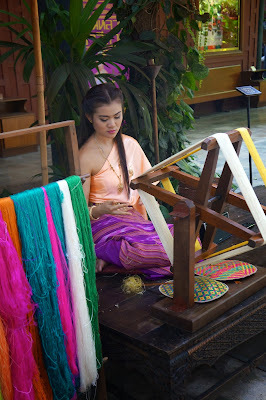 One of the reasons Thompson was so enamored by Bangkok was his interest in the tradition of hand weaving of silk. In the 1950s, the craft was considered a neglected cottage industry but he worked to breathe life back into it. Thompson contributed to the industry's growth and many people around the world started to take notice of Thai silk again. Women still weave silk on the Thompson property and wares are sold in the gift shop. Some weavers gave silent demonstrations on the process. We weren't allowed to photograph artifacts in Thompson's collection but they included different statues of Buddha that had been broken. (Thais don't use imperfect images in worship so he was able to collect some very interesting pieces.) We also admired the gardens around the homes that included large Chinese ceramic pots that held fish and of course, beautiful lotus flowers. One of my favorite parts of the tour was watching traditional Thai dance. A woman danced slowly while wearing bright silk wraps and finger extensions. 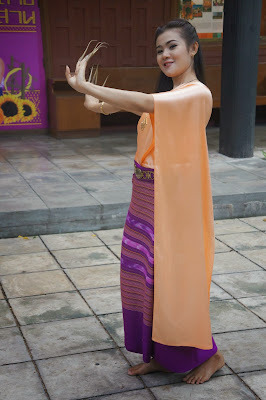 Dance is a major art form in Thailand and consists of "high art" (elaborate productions) and "low art" (folk dancing). There are dozens and dozens of different types of dances in Thailand. While I don't know the name of the dance this woman was performing, it was mesmerizing.